If you listen to the YouTube recording listed on Mam Lisa's site, starting at 1:57, you’ll notice a difference from what was covered in Part I. Instead of jin (you), they use the word ús, which means "our" or “us” and is pronounced with a vowel that sounds somewhat between an “ih” as in “bit” and an “ee” as in “creek.” EEs. Studying Frisian is not always an exact science, especially with so few resources available in English. With that in mind, let’s look at the next few lines of “De Maitiid.” You might notice some variation between the pronunciations gathered from P. Sipma’s book and the online recording. Moai is a very useful Frisian word. It means “nice” or “beautiful” and is pronounced with the “oy” ending found in “boy.” Here, there is a final –e added in the Frisian and a final schwa added to our pronunciation. MOY-uh. According to P. Sipma on page 61 of his free book, this is because it is following a definite or indefinite article (de) and is modifying a masculine or feminine noun. At this stage, I’m personally not worrying about points of grammar too much, though. Mei sounds like the English “my,” rhyming with “dye.” MIGH. 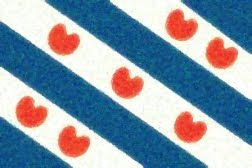 You can spot the -ei combination­ in a number of Frisian words, including dei, discussed previously. Remember that the –ei­ diphthong sounds like the word “eye” when you see it. Loft means sky: just hink of the English word “lofty” to remember it. The vowel is a full “oh” like in “road” or “boat.” LOHFt. Is foar minsken en foar blom grif it moaiste skoft. For people and for flowers is certainly the most beautiful period of time. Notice the –ste ending on moaie in this line. Just like in English, -st indicates that the adjective is the most of something, i.e., the most beautiful. Skoft is said with a full “oh” too, like loft. It means a “period of time,” “a while,” or “a part of the day.” SKOHft. That’s it for the chorus. In Part III, we’ll look at one of the verses of “De Maitiid” that is not translated on the website. The first verse is about birds in treetops, but I cannot find translations for all of the words, so I’m going to leave it be and go straight to the second verse.